This image is identical to the 5 minute window, except it shows the last 20 minutes of waveforms. Also, in addition to the automatic high frequency detections (local Baer picks) in red, if manual picks are available, they are shown in blue (P-picks) and green (S-picks). The image is updated every 60 s, the waveforms are also deconvolved and band-passed from 1-30Hz. The units are bandpassed ground velocity, mm/s. 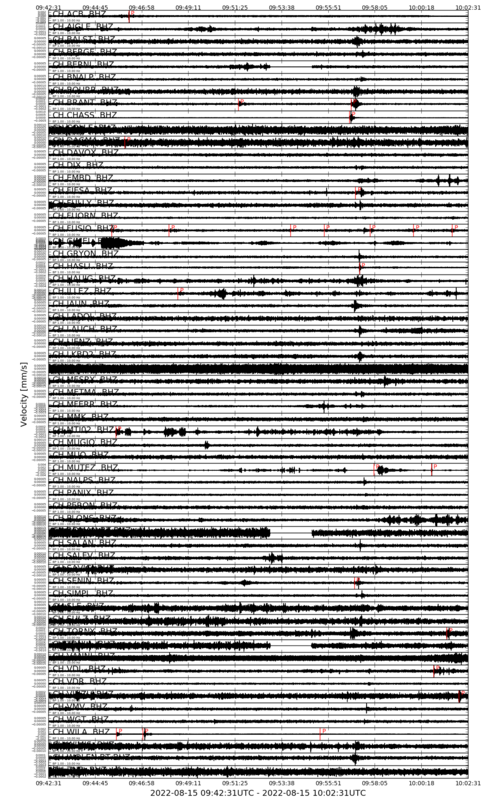 This view shows local and regional events that have moved outside the 5 minute window; the wider time period also allows better observation of foreshocks and aftershocks, as well large regional and teleseismic events.